A parliamentary report of 1777 listed a parish workhouse in operation in Halstead (sometimes spelt Halsted) with accommodation for up to 80 inmates. There were also establishments at Hedingham Castle (65 inmates), Great Earls Colne (42), Engain Colne [Colne Engaine] (30), Gosfield (20), Great Yeldham (20), Pebmarsh (12), Ridgewell (24), Hedingham Sible (30), and Toppesfield (30). Halstead's workhouse was located at the north-east of the town in what is now Mill Chase, formerly known as School Lane, and prior to that as Workhouse Lane. By the 1830s, the buildings included a kitchen, dining-room, factory, male and female dormitories, brew-house, and piggery. Colne Engaine had a workhouse in operation by the 1750s. In 1756, William Andrews was appointed as master of the workhouse at a salary of 14 s. per month. The workhouse appears to have ceased operation for a period during the 1760s but had re-opened by 1775. In 1786, John Spurgeon and his wife took over management of the establishment at a salary of £12 per annum. A house at the west side of The Green in Colne Engaine served as the parish's workhouse in its latter years. Colne Engaine former parish workhouse, 2006. Castle Hedingham erected a parish workhouse in the early 1760s which is thought to be a house at the north side of Nunnery Street.. In 1763, the master of the workhouse received a salary of £18.10s per annum, with the parish also paying for the inmates' maintenance. 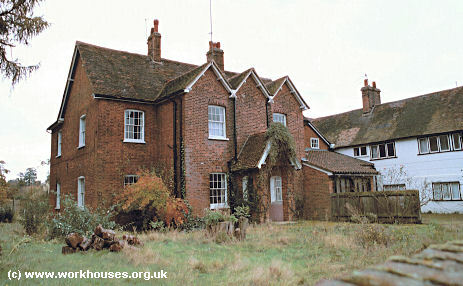 Castle Hedingham former parish workhouse, 2006. 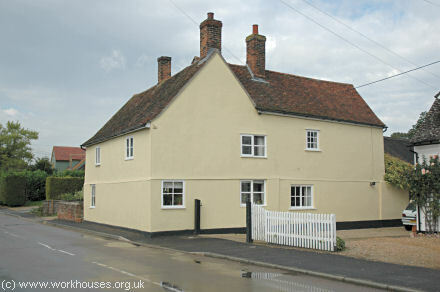 Sible Hedingham had a workhouse by 1745, located in two rented cottages on Church Street. 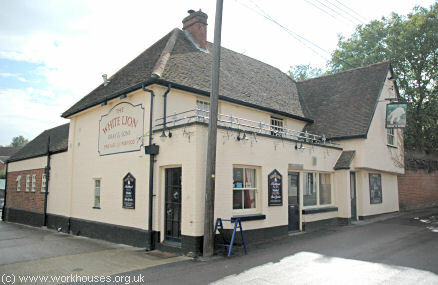 What is now the White Lion public house on Church Street is reputed to have formerly been used as the workhouse. Sible Hedingham former parish workhouse, 2006. County of Essex: Castle Hedingham (2), Colne Engaine, Earls Colne (2), Gosfield, Great Maplestead, Great Yeldham, Halstead (4), Little Maplestead, Little Yeldham, Pebmarsh, Ridgewell, Sible Hedingham (2), Stambourne, Tilbury-juxta-Clare, Toppesfield (2), White Colne. The population falling within the Union at the 1831 census had been 15,901 with parishes ranging in size from Tilbury-juxta-Clare (population 236) to Halstead (4,637). The average annual poor-rate expenditure for the period 1833-35 had been £16,821 or £1.1s.2d. per head of the population. At the time of the union's formation, only three of its member parishes were still operating local workhouses — Halstead, Earls Colne, and Sible Hedingham. These were then used to accommodate different classes of workhouse inmates, with Earls Colne being used for the aged and infirm. A new Halstead Union workhouse was built in 1838 at a site on North Street (now Hedingham Lane). It was designed by William T Nash, who was also the architect of Union workhouses at Royston, St Ives, Halstead, and Caxton and Arrington. His design for Halstead was based on a variation of Sampson Kempthorne's model "square" plan published by the Poor Law Commissioners in 1835. Its construction cost approximately £7,500 and was planned to accommodate 300 inmates. The workhouse location and layout are shown on the 1898 OS map below. In 1870, infectious wards were added at the rear, forming the basis of the infirmary which was extended in 1893 and 1901. 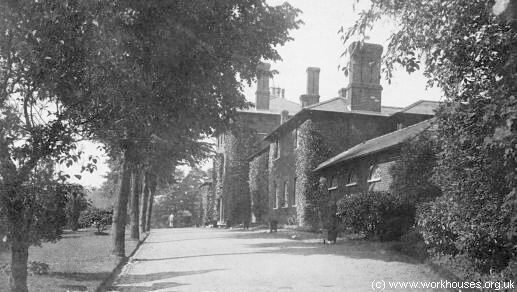 Halstead workhouse entrance block from the south c.1920. By 1922, the workhouse had fallen into disuse and was demolished. In 1925, "rest-homes" endowed by the industrialist Courtauld were erected on the site. Halstead former workhouse site, 2000. In 1869, an industrial school for girls under 14 years of age was opened at the east side of Bois Field. It opened in 1869 and was certified under the Industrial Schools Act of 1866 for the reception of sixty girls, under the superintendence of Miss Lucy Greenwood. 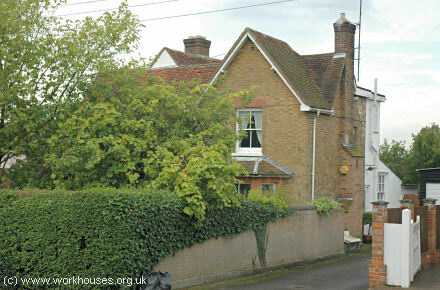 Although not directly connected with the union workhouse, the premises may have been the location the former Halstead parish workhouse. Miss Greenwood also owned a property known as the Chase, at the south side of Bois Field, which was used as an institute for training girls who had served their time in the Industrial School. Essex Record Office, Wharf Road Chelmsford CM2 6YT. Holdings include: Guardians' minutes (1835-1930); Ledgers (1835-1930); etc.